Vitamin C is one of the most proven, well-established and powerful immune boosting, anti-oxidant, anti-aging, anti-viral, anti-pathogenic and anti-toxin nutrient known to man. These benefits have been clearly demonstrated over time and yet human beings are amongst only a handful of animal species that cannot produce their own supply of vitamin C so absolutely must source it from food or via supplementation. We simply can’t function without vitamin C, not just because of its antioxidant properties but also because of the myriad of mechanisms throughout the body it has to support. It helps to assemble neurotransmitters, lower blood cholesterol, manufacture collagen, increase iron absorption in the gut, metabolise protein and protect tissues and cells from the damaging effects of free radicals. Virtually all cells in the body depend upon it. We use vitamin C constantly and yet many people’s intake falls far short of what they actually need. Our daily requirement for vitamin C is higher than any other water-soluble vitamin, particularly during times of stress and illness when levels can drop. Most people take vitamin C to support their immune systems and rightly so, as researchers have finally conceded that it really does help support our immune system. The remarkable benefits of vitamin C don’t just stop there though. Research into vitamin C is extensive and the positive benefits identified are numerous. The extensive health benefits of vitamin C are obvious but most people simply don’t get enough in their diet. This is further hindered by its limited bioavailability. Supplementing vitamin C provides a reasonable alternative; unfortunately it is difficult for the body to absorb large amounts of standard vitamin C all at once because of its inability to withstand the digestive processes in the body. At best, the body can only absorb up to 200mg of standard vitamin C at a time, the rest is rapidly eliminated from the body through the urine. Much higher doses can cause gastric distress including gas, cramps and diarrhoea. Until recently intravenous delivery of vitamin C has proven to be the most effective route for absorption, but this method of delivery is both costly and impractical. However, Liposomal vitamin C allows you to take vitamin C orally ensuring it reaches the cells where it is needed. 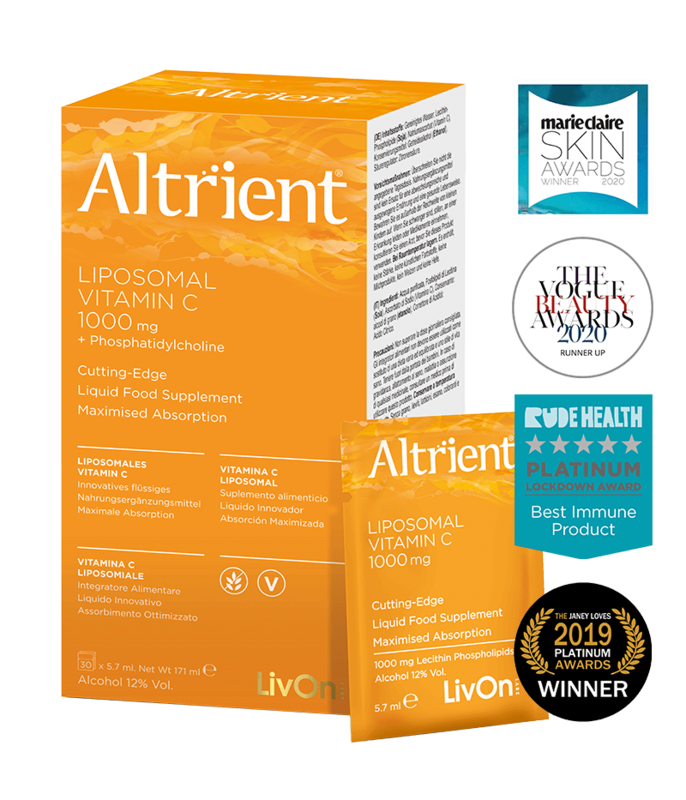 Liposomal technology is able to increase the absorption of nutrients by capturing the active ingredients inside protective membranes called liposomes. These tiny liposomal bubbles consist of bi-layers of phospholipid molecules (similar to your own body’s cell membranes), that protect the contents and manage to by-pass the digestive juices to deliver the vitamin C directly to the cells. This unique method of delivery protects the vitamin C from oxidation and degradation avoiding gastro-intestinal distress and ensures almost 100% bioavailability. A substantial number of studies have already documented the versatile advantages of using Liposomes for targeted site-specific delivery and efficient absorption through cells.